Indiana is home to some of the country's most well-known and respected colleges and universities. From groundbreaking research to major college athletics, there is something for every student. This guide provides comprehensive research on colleges in Indiana, including school rankings, tuition and living costs, financial aid, and student planning resources. Read on to learn more about choosing a program and attending college in the state. College rankings are an excellent place to begin researching school options. Using an intricate scoring system and data collection process, our education experts rated Indiana colleges using key factors such as tuition cost, financial aid availability, student-to-teacher ratio, graduation rate and alumni earnings data. Browse the list below to see which Indiana colleges and universities are best-in-class for the 2017-2018 academic year. With considerations like size of the university, program availability, price, and more, there's a lot to research about Indiana colleges and universities. The search tool below is engineered to help aspiring students quickly learn about and compare universities based on the attributes that matter most to them. Whether one needs help getting into college or information once enrolled, Indiana residents can take advantage of a variety of state resources to help them navigate the often overwhelming postsecondary landscape. State resources can help students sort through financial and academic requirements, aid for underrepresented students and potential career paths. The list below is a brief summary of several Indiana college planning and support programs. The 21st Century Scholars Program provides up to four years of full-tuition scholarships at any public college or university in Indiana. If award winners wish to attend a non-profit, private institution, the scholarship will compensate the award winner with an amount comparable to a four-year public college. The scholarship is awarded to high school seniors who - beginning in 9th grade - complete all 12 college and career preparation tasks established by a program called ScholarTrack. Learn More Indiana is a comprehensive website built around the needs of each student. There are sections for students, parents, veterans, educators and adult learners regarding career, college and cost. This resource is particularly useful for students that may be unsure of their career path as well as which college to go to, as it has a career tool made to help students find their passion. Additionally, the resource takes an in-depth look at paying for college and the 21st Century Scholar Program. College Choice is Indiana’s answer to the climbing cost of a college education. The 529 college savings plan is broken down into three different options: a direct savings plan, a CollegeChoice Adviser or a CollegeChoiceCD account. Each option is differentiated by the method and time required to invest in the savings plan. Though this resource is most beneficial for those that plan years in advance, it can be a useful tool in deciding how and when to pay for college. The site also offers links to federal state resources such as the Indiana Education Savings Authority and the Indiana Treasurer of State. College is a sizeable financial investment, but there are ways to minimize one's long-term student debt. Indiana colleges often offer considerable financial aid to in-state residents. The charts below give prospective students a breakdown of the cost of college in Indiana and the average financial aid amounts given to students. While it's helpful to know the general financial landscape of colleges in Indiana, it's even more useful to know which are the most affordable. The six-school ranking below was determined by the net costs – tuition and fees minus financial aid – of various Indiana colleges. While a college education enlightens and educates, it also serves the aim to create a financially stable future for graduates. One way to measure this effectively is by analyzing which schools have the highest paid alumni 10 years down the line. The ranking below spotlights which Indiana colleges produce the highest-paid alumni and compares them against the national average. With increasing student loans becoming a point of national concern, another important measure of financial viability is the debt that alumni face after they graduate. The following ranking was determined by analyzing the schools that produced alumni with the lowest student debt and comparing them to the national average to create a reliable list of cost-effective universities in the state. When it comes to financial responsibilities as a college student, very little matters more than the cost of tuition and the cost-of-living. Those who choose to attend college in Indiana are lucky in that the state's cost-of-living is less than the national average, but it doesn’t hurt to have a breakdown of average living expenses in its largest metropolitan areas. Continue to the table below to learn more. Making sure that universities are accredited before you send in an application is an important step in securing a quality college education. Accreditation ensures that the college and program of your choice meet regional, and sometimes national, standards. 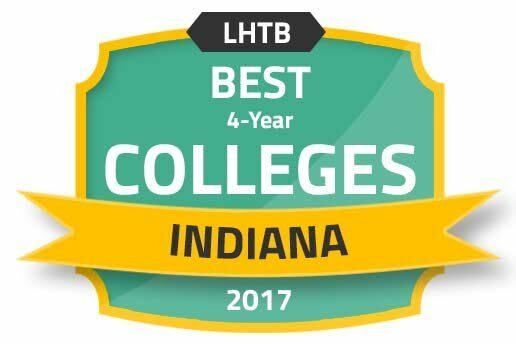 Colleges in Indiana are regionally accredited by the Higher Learning Commission. The Accrediting Bureau of Health Education Schools approves the allied health program at Brightwood College in Indianapolis, Indiana. The Association to Advance Collegiate Schools of Business accredits Purdue University's undergraduate accounting program. Evansville, Indiana is the third largest city in the state and was named one of the 100 best communities for young people in 2005. There are at least five colleges in Evansville, which for a city of around 300,000 is quite a lot. Though there are plenty of universities, they tend to have fewer than 10,000 enrollments, making the overall learning environment more personal. The University of Southern Indiana is a public institution located just outside Evansville in Vanderburgh County. The university's primary focus is on credit program delivery with 70 undergraduate programs, 10 master's programs and one doctoral program. The university services both the metropolitan area and the surrounding rural areas. The University of Evansville is a private institution affiliated with the United Methodist Church. UE is centrally located just three hours from St. Louis, three hours from Indianapolis and two hours away from Nashville. It is a small university enrolling about 2,500 students, the average class size being 18 students. The university offers over 80 different majors and courses of study. As the 12th largest city in the United States, Indianapolis has a higher education landscape all its own. There are over 50 universities and colleges in the greater Indianapolis area, and with that comes a thriving postsecondary community. There are large universities, public and private, in addition to high-quality community colleges that prospective students can attend, depending on their education and career goals. Continue reading to learn more about three universities representative of the college community in Indianapolis. Located in the historic Butler-Tarkington neighborhood, Butler University is a small school with approximately 5,000 students. The university is not religiously affiliated and has a very high rate of student engagement. There are over 150 student organizations in which 94 percent of the student population is involved. Greek life is also prominent at the university with 35 percent of students participating. Butler competes in Division I sports and has an impressive string of league championships. The University of Indianapolis is small, private institution located near downtown Indianapolis. There are just over 5,400 students enrolled in the college, which is affiliated with the United Methodist Church. The university is recognized nationally for its health sciences, teacher education and communications undergraduate programs. The Indiana University Purdue - University Indianapolis is a public research institution located near the state capitol. It serves more than 30,000 students from all over the nation and globe. IUPUI prides itself on its research as it was formed as a 1969 merger between Indiana University and Purdue University. It holds 17 schools and offers over 350 academic programs between Indiana and Purdue University. Independent Colleges Indiana offers student resources specific to Indiana's 31 private, non-profit colleges. The Indiana Campus Compact is a consortium of university presidents and chancellors from public, private and two-year colleges. The Indiana College Cost Estimator allows students and parents to access information related to paying for college. ISM College Planning offers resources in areas such as college planning and financial aid. Next Indiana provides high school students with resources to guide them through the months following graduation. Transfer Indiana has higher education resources for high school students, college students looking to transfer, and advisors and counselors.